Instead of star sightings, find manatees and beautiful beaches in this other Hollywood. As any native is quick to tell you, the reputation South Florida has for being a spring break destination is outdated. While you’ll definitely encounter vacationing college kids during a visit in March or April, it’s nothing like the drunken throngs of coeds depicted in those spring break movies from the 1980s. Because the city banned drinking on its beaches, the party kids now escape to Mexico for their wet T-shirt contests—which means you can enjoy the beaches, seafood-heavy dining scene and nature preserves without being offered a beer bong. It’s never been easier to make an escape to Hollywood, which shares the same airport as Fort Lauderdale. All winter, airlines have offered last-minute deals from Chicago (sign up for weekly newsletters from sites such as travelocity.com or smarterliving.com, and you’ll be alerted to the round-trip tickets that have been going for around $130), and the rates are still relatively low. 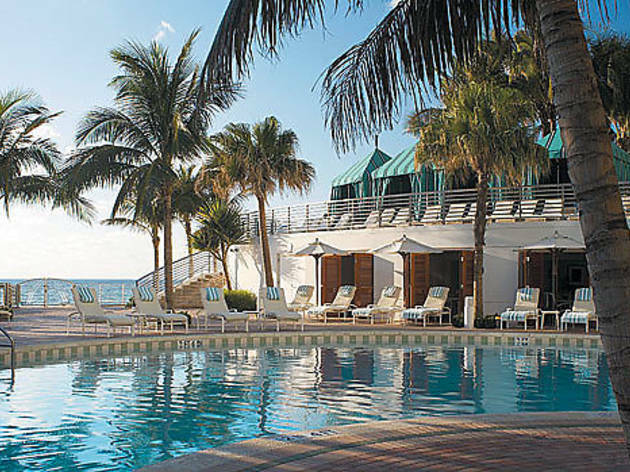 Saving so much money getting there can help justify splurging on your hotel. And if you’re going to splurge, there’s no better place than the beachside Westin Diplomat Resort & Spa in Hollywood (3555 S Ocean Dr, 954-602-6000; rates start at around $220). 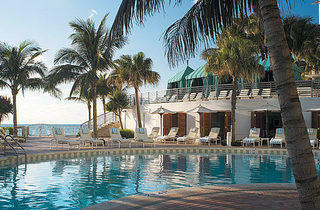 You’ll want to spend at least half a day lounging at the hotel’s pools (pictured above) and beachfront area. If you bring your laptop, though, don’t bother paying for the overpriced in-room Internet access ($18 per day). The city of Hollywood offers free Wi-Fi, so you’ll be able to get online anywhere outside of your room. For dinner, stay close to home and indulge in the hotel’s signature restaurant, Hollywood Prime (954-602-8393). The portions of upscale steak and seafood are so large, you’ll be thankful that you’ll only need to roll yourself up to your room at the end of the night. Hollywood is also home to Seminole Hard Rock Hotel & Casino (1 Seminole Way), a.k.a. the place where Anna Nicole Smith died. The casino is a classic example of excess: too many oversize clubs, low-paying slot machines and chain-smoking patrons wearing tight and shiny clothes. Skip that tourist trap and instead plan a day in more natural habitat. Hop on the free Hollywood Trolley and head south to John U. Lloyd State Park, where you can take a guided kayak tour (954-328-5231; $65 per person) of Whiskey Creek. The two-hour tour allows you to paddle along sea marshes and the Intracoastal Waterway, looking for endangered Florida manatees and other sea creatures. Even if the manatees stay hidden, it’s still cool to be in the same waters that bootleggers once used to avoid law enforcement. After the tour, stay in the park and enjoy lunch at Loggerhead Cafe, located on a pier over the beach. The popular lunch spot serves locally caught seafood and is known for its tasty lobster burger. Another area easily accessible via trolley is downtown Hollywood. The district may not boast a skyline, but it does offer the 10-acre Artspark, which was recently remodeled. The park features a water sculpture by Japanese artist Ritsuko Taho, a baobab tree and its musical “life energy waves,” as well as free concerts every Friday evening. The building on the park’s grounds includes a gallery and free, outdoor glassblowing demonstrations. Stick around downtown and wander over to Harrison Street, where you’ll find shops to browse in, an oddly large number of dance studios and the trendy restaurant Lola’s on Harrison (pictured, 2032 Harrison St). Serving contemporary American food that blends sophistication with comfort (think Coca-Cola BBQ beef ribs), this is probably the most stylish restaurant in the area. For an after-dinner glass of wine, head to nearby VINO (1910 Harrison St, 954-929-8686), a wine shop with a bar and a few tables in the windows—perfect for people-watching over a bottle of white. Around the corner, the Hollywood party scene also includes Latin music at Spice Resto Lounge (1934 Hollywood Blvd, 954-923-3888) and live jazz at Sushi Blues Cafe (2009 Harrison St, 954-929-9560). The Hollywood Beach Broadwalk (Yes, it really is Broadwalk, even though you’ll mistakenly call it a boardwalk all weekend; pictured) is a popular weekend-morning destination for tourists and residents. The two-plus-mile brick-paved, oceanside promenade is a throwback to the 1970s and ’80s—Rollerbladers, bicyclists and games of beach volleyball are plentiful. If there’s ever a remake of Three’s Company, the opening credits should be filmed here. Brunch options abound on the Broadwalk, but standouts include Sugar Reef Tropical Grill (600 N Surf Rd, 954-922-1119), which features mimosas with freshly squeezed juice and lovely views of the beach. Josh’s Organic Market (located at Harrison St and the Broadwalk), a farmers’ market open only on Sundays, offers a variety of fresh produce—just right for a morning picnic at the beach. Still worried about encountering spring breakers? If there are any in town, they’ll be sleeping in on Sunday morning, so kick back and relax—you’ll have the beach to yourself. *We found the cheapest direct flights on AirTran and Southwest.